It was Wisconsin where I first learned to love the brat. Bratwurst was a new thing to me, child of new Jersey that I am, but here in this new land it was as common as the Italian sausage I knew and loved was back home. It was 1992, and I was living away from the East Coast for the first time. I ate an awful lot of brats and drank an awful lot of beer when I was a student at UW-Madison. Then I moved back to Long Island, and there I met a woman named Jen, who would ultimately become my wife for a time. Ironically, Jen was from Wisconsin, and when it came time to meet her family, I found myself back on familiar ground. 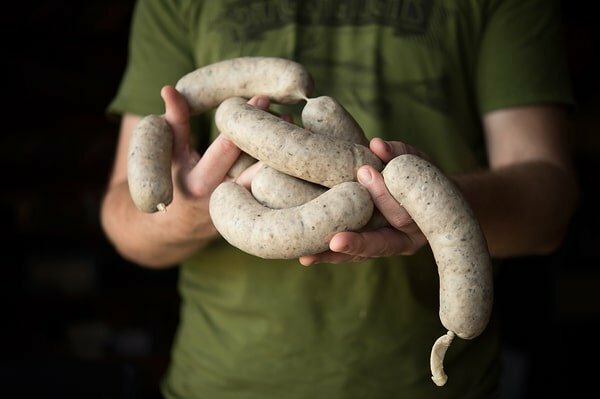 It was Jen’s uncle Casey — Casimir Migacz — who first showed me how to make this sausage. Casey was a gruff older man, probably in his sixties, a true blue collar, stand-up guy. Deer hunter, family man, lover of Friday night fish fry. One day he invited us down into his workshop/basement. It was time to make sausage. Brats, to be exact. And not just any kind of brat, the classic “white brat” made famous in nearby Shebogyan. Sheboygan brats owe their origin to the classic German bratwurst, possibly the Nürnberger variety, which looks and tastes similar. No two recipes are alike, but they all tend to have marjoram, ginger, nutmeg, black or white pepper, and occasionally mustard seed, caraway and other spices. Many recipes have a bit of egg and or cream in them, too. Casey’s recipe had most of these ingredients, although no egg or caraway. We made a giant batch, easily 30 pounds, and it was made with the traditional mix of pork and veal. My recipe here is a turkey sausage with some pork. (Wild turkey is an excellent white meat for sausage-making.) I used trim off the carcass, as well as the thigh meat and some of the breast. 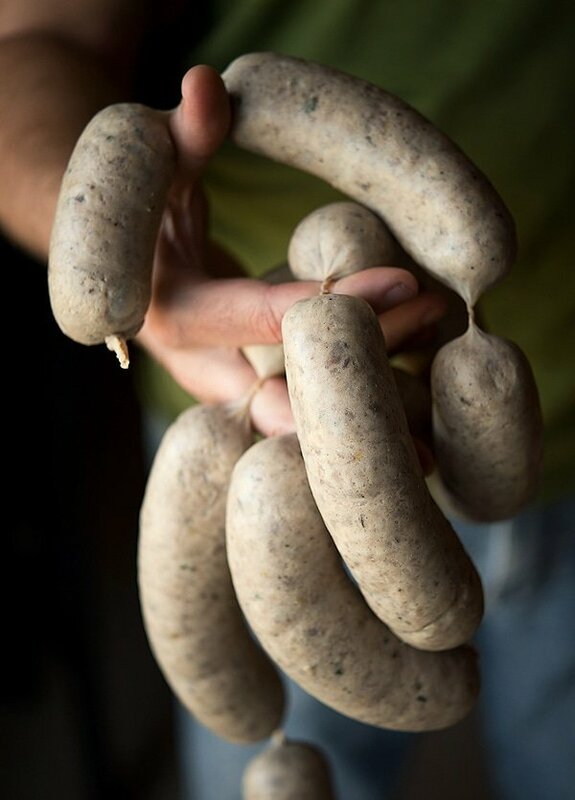 No matter what meats you use, a Sheboygan brat is light in color, medium-coarse — somewhere between an Italian sausage and a hot dog — rich, and bright with that medieval spice mix, which feels like its been around for a millennium. Grill these turkey sausages and serve them on a roll with mustard and sauerkraut or caramelized onions. There ain’t nothing better when the Badgers or Packers are playing. Of course, you can eat them rooting for another team, too, I suppose. 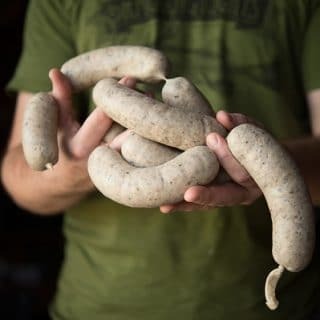 I like making this sausage with wild turkey because it gives me that nice white color -- veal would be traditional, but I don't use veal at home. You can do this with any white meat bird, too, such as pheasant or chukar or partridge. Of course an all-pork white brat is also pretty common. I do everything in grams here because you really do need some precision, especially with salt. If you don't own a kitchen scale, get one. You can alter the seasonings if you want, but this is a pretty fair re-creation of the Sheboygan brats I ate when I lived in Wisconsin, so try it this way first before you tinker. Get out about 10 feet of hog casings and soak them in warm water. Cut the meat and fat into chunks you can fit into your meat grinder. Mix together the salt, pepper, marjoram, ginger and nutmeg, then mix this with the meat and fat until every piece has a little on it. 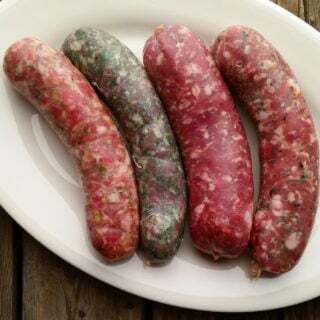 Refrigerate overnight if you want, but let it marinate at least an hour or so; this helps develop myosin in the mixture, which helps the texture of the finished sausage. When you are ready to grind, put the meat in the freezer until it is between 30°F and 40°F. Put your grinder parts (auger, dies, blades, etc) in the freezer, too, and put a bowl in the fridge. Grind one-third of the mixture through the coarse die on your grinder, and the rest through the fine die. This creates a more interesting texture. If your meat mixture is still at 35°F or colder, you can go right to binding. If it has heated up, you need to chill everything back down. Use this time to clean up the grinder. Once the meat is cold, put it in a large bin or bowl and add the dry milk, caraway, mustard seed, egg white and heavy cream. Mix well with your (very clean) hands for 2 to 3 minutes — a good indicator of temperature is that your hands should ache with cold when you do this. You want to to mix until the meat binds to itself. You can also do this in a stand mixer set on its lowest setting, but I find you don’t get as good a bind as you do when you do this by hand. You now have bratwurst. To make links, put the loose sausage into a stuffer and thread a casing onto it. Stuffing sausage is easier with two people, one to fill the links, the other to coil, but I do it solo all the time. Stuff the links well but not super-tight, as you will not be able to tie them off later if they are too full. Don’t worry about air pockets yet. Stuff the whole casing, leaving lots of room on either end to tie them off; I leave at least three inches of unstuffed casing on either end of the coil. To form the individual links, tie off one end of the coil. Now pinch off two links of about six inches long. Rotate the link between your hands forward a few times. Look for air pockets. To remove them, set a large needle or a sausage pricker into a stovetop burner until it glows (this sterilizes it), then pierce the casing at the air pockets. Twist the links a little and gently compress them until they are nice and tight. Repeat this process with the rest of the sausage. 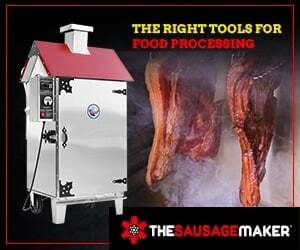 Poach your links to set the sausage. Get a large pot of water to about 160°F, which is steaming. Gently poach your sausage in this for 20 to 30 minutes. Don't let the water get too hot. Take the sausages out and plunge them into a big bowl of ice water to stop the cooking. Hang your links for an hour or so to dry. Once you’ve taken the links down, they can be refrigerated for up to a week, or frozen for up to a year. I like serving these brats on a bun with sauerkraut and mustard, but you could roast them and serve with potatoes or put them in a stew. Mostly I like eating these on the grill at parties, though. I made with domestic rabbit (the other white meat bird at our house) and pork fat recently. What a treat! They turned out wonderfully! I’ve made these twice now, per the recipe, using a mix of pork and veal. They are perfect. I like them both simmered with sauerkraut or grilled. And the step by step instructions here, really true for every recipe on this site, are the best of anywhere. Thank you!! !